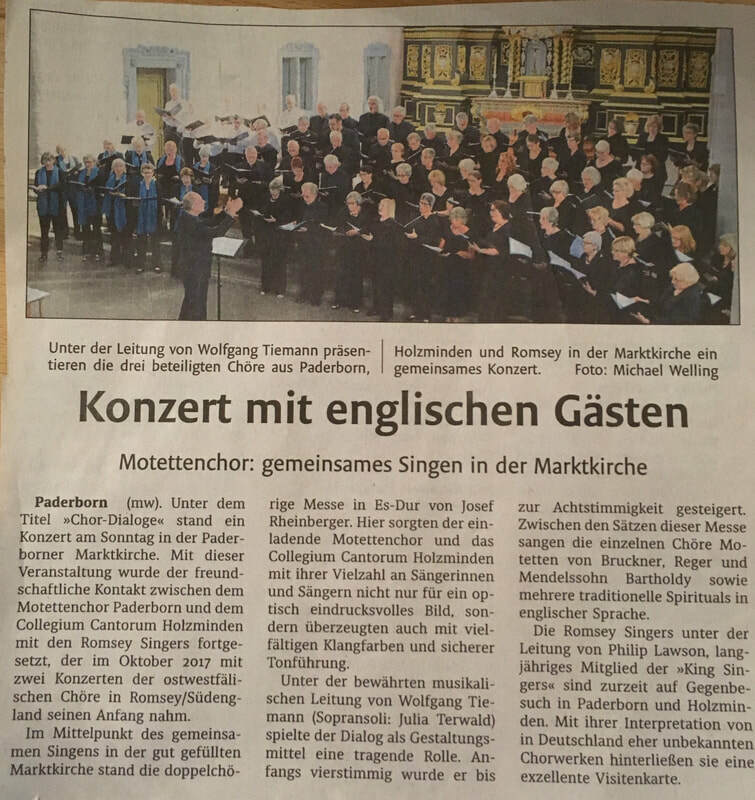 A concert with the title "Choir-Dialogue" took place on Sunday in the Paderborn Marktkirche. The friendly liaison between the Motettenchor Paderborn and Collegium Cantorum Holzminden and the Romsey Singers was resumed; it had its beginning with two concerts by the East Westphalian choirs in Romsey, in the south of England, in October 2017. A centrepiece of the singing together in the well-filled Marktkirche was the Rheinberger Mass in E flat for double choir. Here the hosting choirs with their multitude of singers not only made for a visually impressive sight, but also were convincing with a variety of timbres and secure sound management. Under the proven musical direction of Wolfgang Tiemann (Julia Terwald, soprano soloist), the dialogue played a major role as a structure [for the concert]. Four voice parts increased to eight. Between the movements of the mass, the individual choirs sang motets by Bruckner, Reger, and Mendelssohn-Bartholdy as well as several traditional spirituals in English. The Romsey Singers under the direction of Philip Lawson, a longstanding member of The King's Singers, are currently on a return visit to Paderborn and Holzminden. With their interpretation of choral works previously unknown in Germany, they left behind an excellent calling card.